All aboard! The third and final leg of the Washington trip starts with our quest to head north even more. We lucked out and the weathermen were dead wrong about their forecasts for rain on Sunday. Partly cloudy skies and comfortable temperatures gave us the perfect environment to enjoy a cruise around Washington. 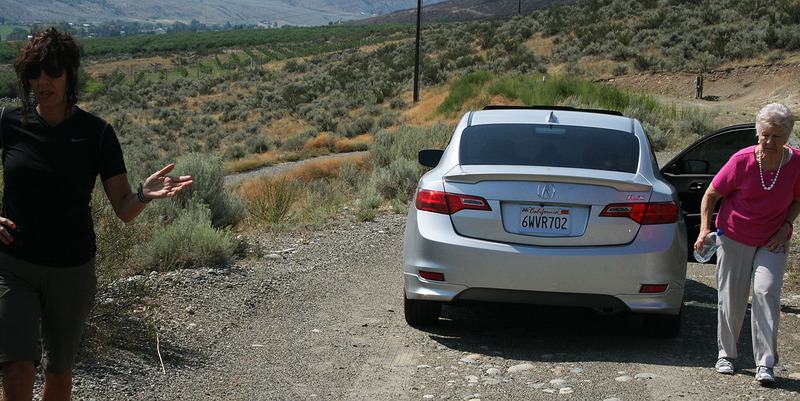 We made our way in the ILX from our hotel in Moses Lake to Highway 155 which parallels Banks Lake. Banks is 27 miles long and covers 27,000 acres of surface area. We’re talking about a lot of water here! Pictured here are my mom, my grandma, and myself. Oh, and the ILX trying to steal all the attention. Not much farther up the road, we entered the cities of Electric City and Grand Coulee. 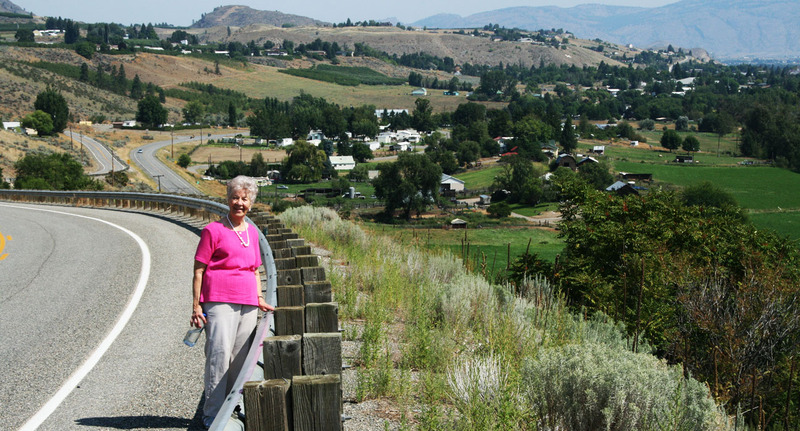 These towns line the waters that back-up from the massive Grand Coulee Dam. It’s impossible to convey in photos just how massive this structure is. The width, in fact, is a mile long! Here are some Grand Coulee Dam fast facts that I found interesting. Needless to say we were awestruck at the size & scope of this engineering marvel. Today, the dam has 3 important functions: irrigation, power production, and flood control. We didn’t take the time to participate in a 50-minute dam tour, but we did spend quite awhile wandering through the exhibits in the Visitor Center. One such exhibit was this scale model. What was mom pointing at here? Who knows. 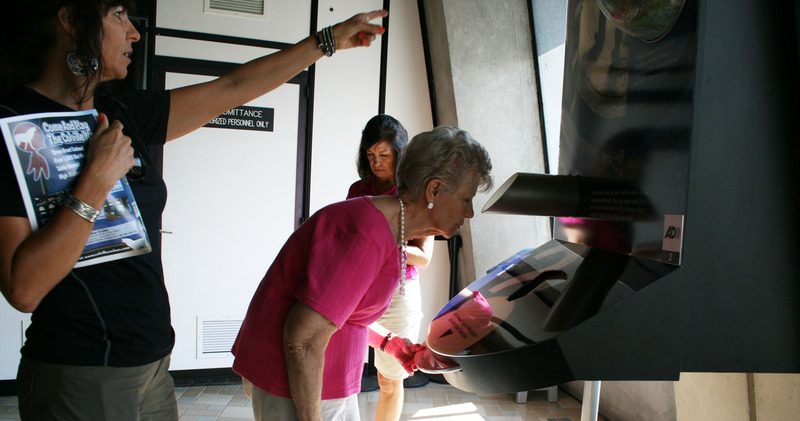 This was one of the most interactive visitor centers I’ve ever been to. 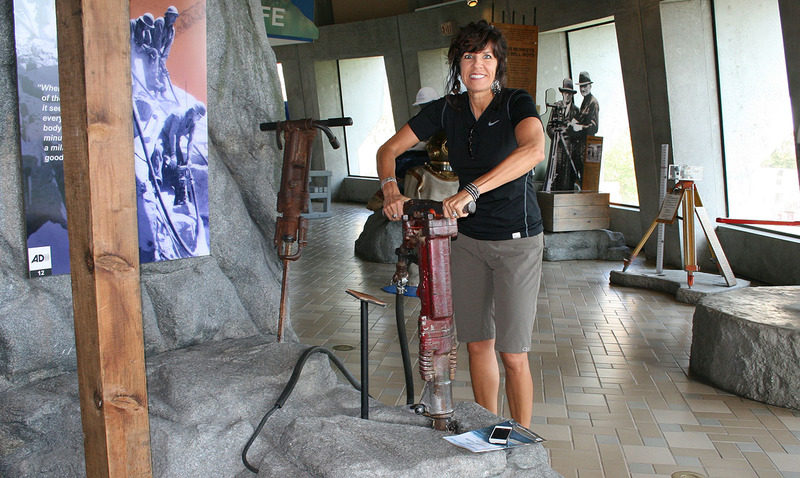 They even have a jackhammer there that you can hold onto and activate. It simulates 1/10th of what an actual jackhammer would feel like. 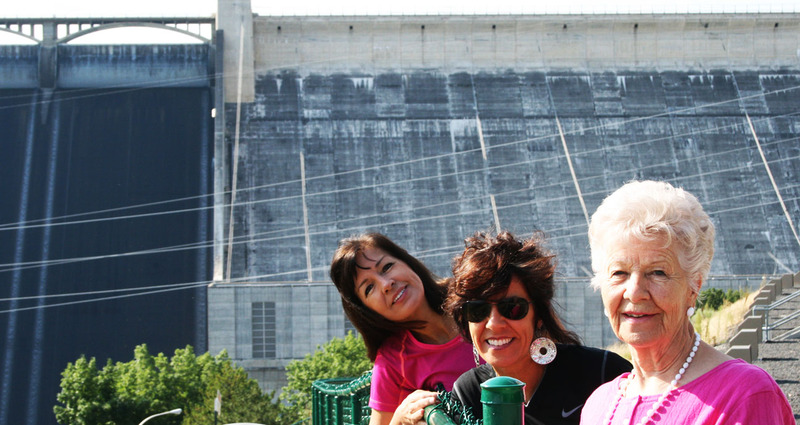 Grand Coulee Dam has a special place in my grandma’s memory because she lived in the area in the early 1950’s. 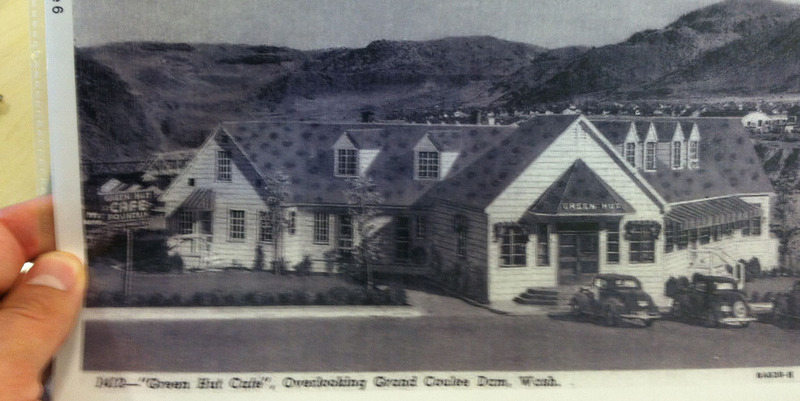 In fact, her workplace (“Green Hut Cafe”) once sat where the visitor center is now located. 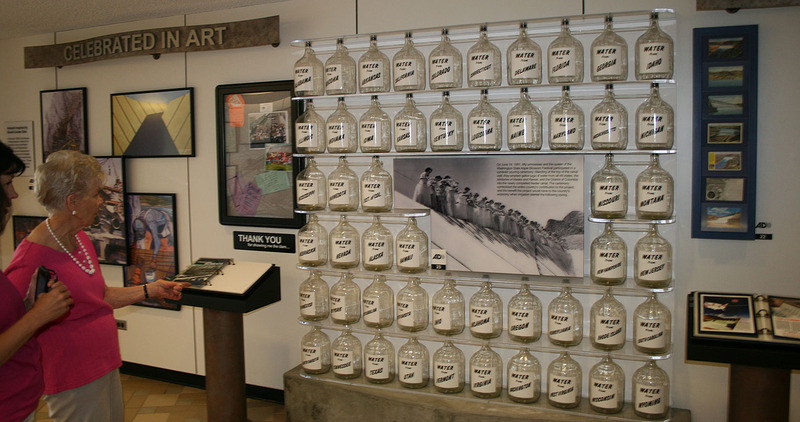 One of the coolest features (I thought) from the exhibits were these 48 glass jugs. Each one was labeled with a different state name. When the Grand Coulee Dam was dedicated in 1942, water from each of the (then 48) states was poured from atop the dam’s spillway — symbolic of the fact that all states had contributed to its construction. I found it fascinating that the flooded area behind the dam ended up wiping out multiple small towns, 2 railroads, 4 sawmills, and even cemeteries. 3,000 people were relocated to make way for the water that started backing up in the mid-1930’s. After we’d had our fill of the dam, we continued our northbound trek on Highway 155, crossing over the 2-lane Grand Coulee Bridge. Our next destination was perhaps a bit odd in purpose, but still very worthwhile and meaningful. 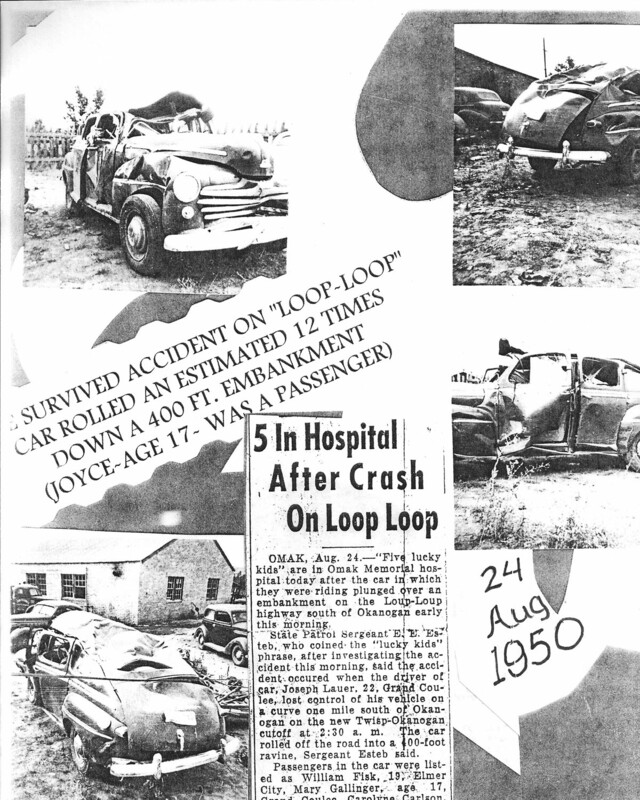 In the early morning hours of August 24, 1950, my grandma was involved as a passenger in an auto accident just south of the town of Okanogan, Washington. The car in which she rode soared up a hill at 85+ miles per hour and plunged off an embankment. Miraculously, even after the car rolled an estimated 12 times, she was able to climb to the main road and seek medical attention. Below is a newspaper article and a few pictures of the vehicle. 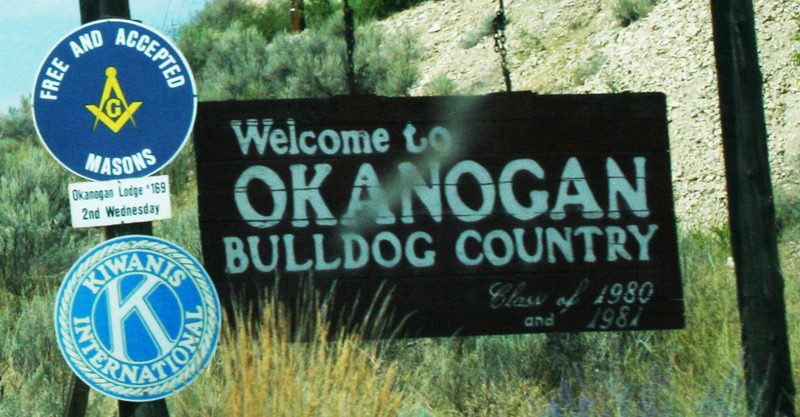 We knew very little about the exact location of the accident but we were determined to find it, so we made our way to Okanogan. The newspaper article had described the site as: “A curve one mile south of Okanogan on the new Twisp-Okanogan cutoff.” Based on some Google satellite mapping research we had done previously we knew that the cutoff was probably Highway 20. Sure enough, just past Okanogan city limits, we saw ahead of us a road which branched off to the right and climbed a steep hill. It was an eery feeling to drive up it, knowing that the road had nearly claimed my grandma’s life 63 years ago. The below picture is thanks to Google since I didn’t take a photo from the base. 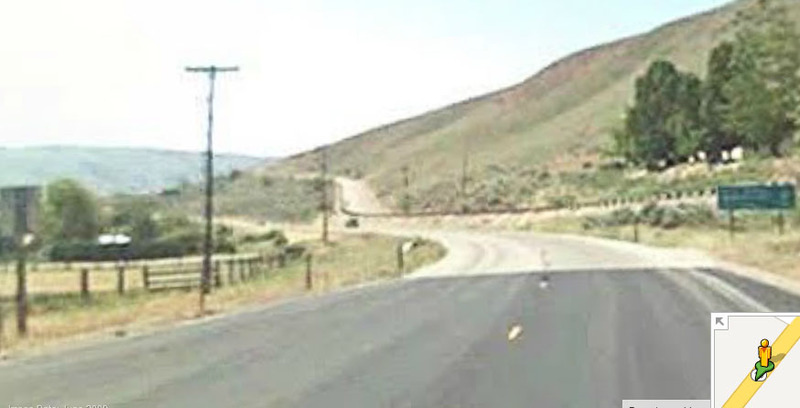 The road at right is the one that climbs away from Highway 20 and has a sharp right-hand turn at the top. We parked the ILX and roamed around this place. The guard rail in place today prevents similar accidents from occurring. My grandma hadn’t been back here since the night of the accident, so technically she had never even seen it in daylight! Here she is standing at the very corner where that driver lost control. 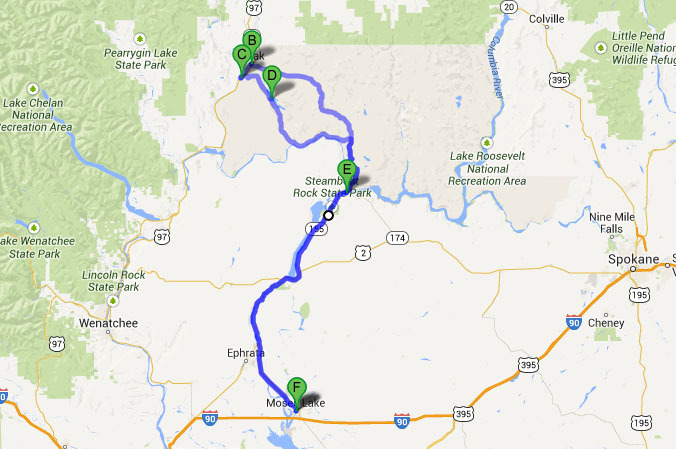 We were hungry from our voyage so we dined in Omak, just north of Okanogan. We happened to arrive just the town’s annual “Stampede” parade had closed Main Street. Soon, though, the road opened back up and we found a parking space and a great Mexican restaurant. 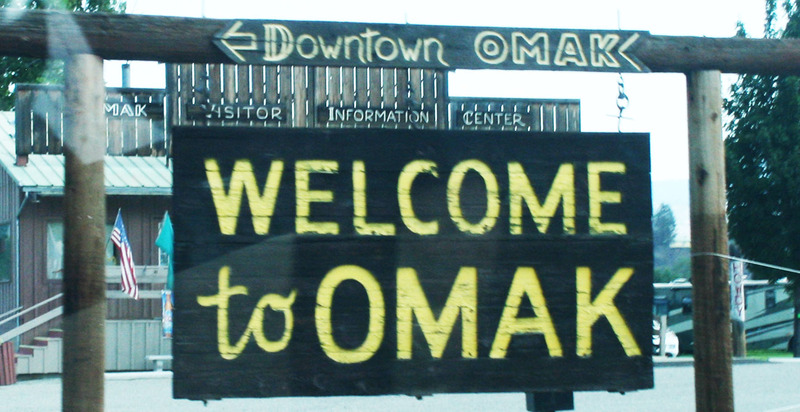 “Downtown Omak: It’s All Right Here!” I guess the word “all” is used pretty loosely here. Omak doesn’t amount to much, but it has a fun vibe to it, and it’s only about 40 miles from the Canadian border. 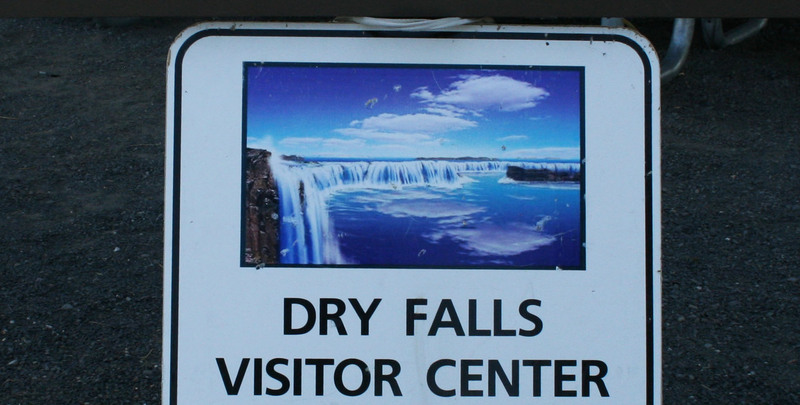 Our last stop for the day, on our way back to Moses Lake, was at Dry Falls. “How can a waterfall be dry?” you ask. The answer would take thousands of years to explain, because that’s how long it took for this place to form. Dry Falls is thought to be the greatest known waterfall that ever existed. It was 10 times bigger than Niagara Falls. Today, though, only the cliffs remain. The cause for the eventual diversion of the water has to do with the melting of a glacier during the Ice Age and its impact on the shifting water flows. It was totally un-planned that I happened to capture Jodi and grandma making the exact same (well, mirror) pose whilst soaking in the splendor of Dry Falls. Even their wardrobe matched. I’d parked next to one of my favorite Hondas of all time: the Prelude. This one looked like a 1992-96 (4th Generation) Si model in pretty nice shape for its age. These cliffs are skeletal remnants of what was once the world’s largest waterfall. They bear stark witness to the tremendous power of catastrophic floods that swept over eastern Washington at the end of the last ice age. The falls began 20 miles to the south, but receded upstream through powerful erosive action. The retreat of the falls gave birth to the canyon below, the Lower Grand Coulee, with the enormous force of the floodwaters spewing several cubic miles of rock over vast areas downstream. Today, Dry Falls remains as one of the most spectacular geologic wonders of the age of ice. At the end of the day, we feasted on the best corn on the cob I’ve ever tasted. Home-grown Washington sweet corn. My cousins are as big into cars as I am, but in a vastly different way. They build demolition derby vehicles and have brought home multiple awards. This big old Chrysler looked pretty unstoppable to me! 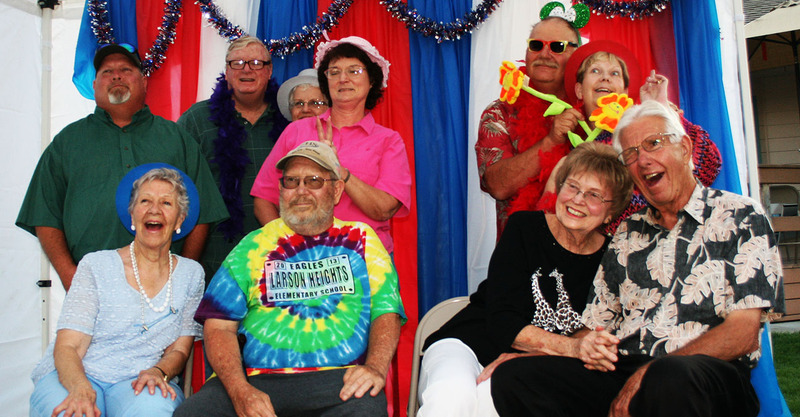 The family reunion brought out the fun in everyone. Billy Bob Tyson, at your service. Tomorrow: The return stretch to Phoenix. Would I survive two more 12-hour driving days in a row? This entry was posted on August 16, 2013 at 5:17 pm and is filed under ILX, Road Trip. You can follow any responses to this entry through the RSS 2.0 feed. You can leave a response, or trackback from your own site. 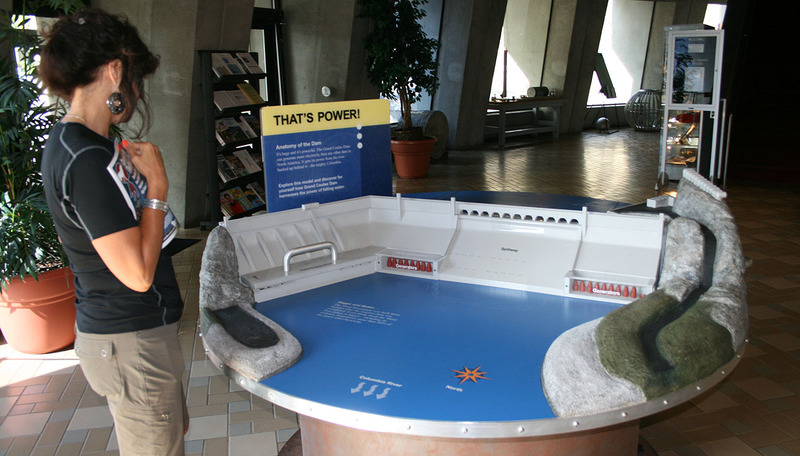 Obviously, whatever I was pointing at inside the Grand Coulee Dam Visitor Center was not intriguing enough to get the attention of my traveling companions (as noted by their lack of attentiveness in your photo). What a superb day that was! If only the ILX could tell its version of this trip…. Tune in later today for the last piece of the trip! It feels so nice to be spending a Saturday at home for a change. It’s been months. Absolutely amazing how well that old ’40’s Buick Roadmaster(?) held up. For it to even get to 85MPH up hill is one thing (Done a little search and found curb weight to be nearly 4,600lbs and the only engine choice of a I8 Fireball 320 168HP paired with a 3 speed manual! ), but to roll an estimated 12 times and for your grandmother to climb out of it and make it up a 400ft embankment for help is unbelievable. A very strong women, she is. Great write up as usual, Tyson. I believe you’ll mainly be seeing your bed when you get back to Phoenix after all these 12-hour drives! Dillon, I think you’re spot-on with telling what car my grandma’s accident involved. I would’ve guessed a 1948 Buick. Thing must have been built like a tank to withstand that many rollovers and not be entirely crushed. Yeah, I’ve finally recovered from the trip but I’m already gearing up for the next! North Carolina awaits, next week. Wooo! My state! Is this the NALM in Raleigh you mentioned earlier this year?